» Highway access? No problem! Well, if there ever are problems with access to the highway from Albany’s new police headquarters, they can always try this as Plan B. Not really, but the issue caught the satirical eye of Darrell Pepper, the retired chief of police who dabbles as a cartoonist. The Albany Planning Commission on Monday cleared the way for the construction of both the police building at 2600 Pacific Blvd. (Highway 99E) and the new downtown fire station on Lyon Street and Sixth Avenue. Considering the years of planning and design work that have already gone into both projects, not to mention the property purchases, planning commission approval was a mere formality, but it was still necessary. The commission quickly and unanimously approved a conditional use permit and other land-use steps for the police building. For the replacement of Fire Station 11, it approved similar actions including closing Sixth Avenue for 194 feet from Lyon Street eastward. The new station will straddle that part of Sixth. The police headquarters will have one driveway on Pacific and a secondary one on Willetta Street near its soutwest corner. 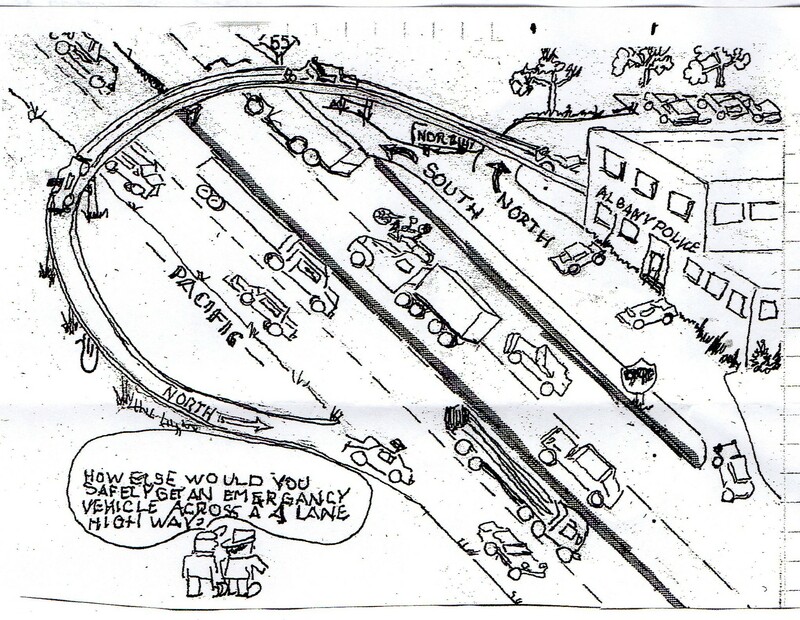 When the highway is busy, making a left directly on Pacific from the main access point will sometimes be a challenge. 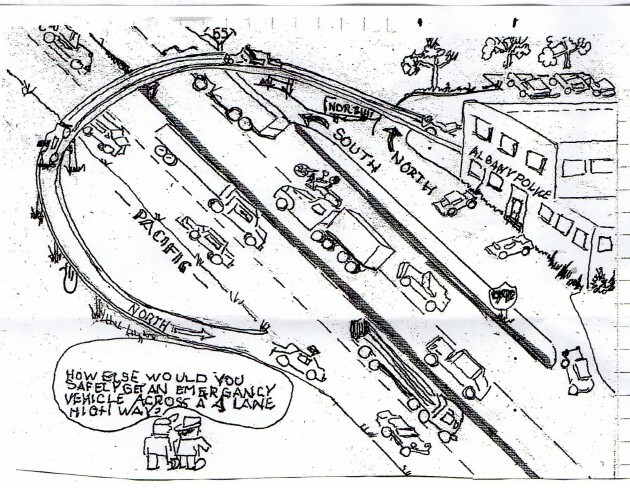 A “flyover” as shown in Pepper’s cartoon might be one answer. Another is to take Willetta to 29th and turn left on Pacific at the signal. The designs of both buildings are in the final stages. Together the city expects the projects to cost around $24 million. (Albany voters approved an $18 million bond issue to cover most of it.) How close the cost estimate is everybody will find out once construction bids are opened some time next year. Our city council has a long history of tone deafness. Now you provide a visual depiction of a problem most of us knew existed dating back to the Burright/Morse committee. Add blindness to deafness. Misunderstandings are likely. Yes – The machinery Is already in motion to make this a reality! My second thought is that the city will now pay a nice sum for this art and put it in the lobby of the new building. I mean, the ordinance says you must spend 1%, right? Well, here is win-win for everyone. And it appears you are having trouble identifying where the boundary of sarcasm lies. I suspect my comment above just adds to your struggle. Gordon you’ve been fighting these projects for what, 5 years now? Why don’t you just give it a rest. You lost. it’s time to let the professionals and elected leaders just get the job done. At the end of the game the teams shake each others hands and move on. Out kids know that and the grown-up’s shouldn’t forget it. Not true, Bob. I supported new facilities for both fire and police. I just didn’t think taxpayers got the best deal from our city council. Alas, I didn’t have a sugar daddy willing to spend $40,000 on a “better deal” campaign. And you don’t even live in Albany. You have no skin in the game. Why should we listen to you on this issue? Darrell Pepper gave me a copy of this drawing many moths ago and gave me permission to use it to try to defeat the expensive poorly located police building. Thanks to a former Chief for bringing a real concern forward. As many workplace cartoons do, this one portrayed a bad solution to a real problem. His concern is still real and valid. I hope that the most effective answer is simply paint and traffic control signals (which work OK near fire stations). Complicated solutions are rarely functional. Let’s think simple and straightforward. Funny you should mention the fire station. Last I heard, ODOT has a problem with the Fire signal light on Lyon and wants it moved/modified in conjunction with the new fire station. Didn’t hear about their reasoning. The current light works fine, is functional, and the price tag to move the light would far exceed any benefit. Hopefully the city can avoid that cost. Makes me think of the ‘New Jail’. Finally got funding and built then guess what. Taxpayers all of the sudden were told there was no money to operate the ‘New Jail’. Geeze at least we weren’t as stupid as the taxpayers in Portland. They built a ‘State of the Art Jail’ that the ‘had to have’ and never ever used it one night. Shame the Voters for being ‘Shamed’. If the new police building has access to the intersection at 29th, have a traffic system interlock to trigger the light for 29th traffic and hold it green until the police car(s) have gotten across and are safely headed north on 99E. Otherwise, put in a new traffic light at the driveway for the station and configure it like the fire station lights on either side of the block where the DH newspaper offices are. Fire trucks used to cross over from Lyons (old charts also show Lyon’s’) to Ellsworth and then turn north against traffic to gain speed for the bridge. Otherwise they had a very slow right hand turn at the bridge and crawled up that obstacle. There was only the one bridge but Ellsworth was one-way. It was exciting to watch cars pull over real fast as three Fire Engines came straight at them.. Drivers were not pre-occupied with texting and loud ear buds then. Now people in Portland walk in front of Max Light Rail. Even Light Rail pounds the ground and makes noise. Wait and see. I bet the city will request more funding to solve this problem. Chief Pepper thought of it. Taxpayers get a foot in their door and have to open more.